Idea borrowed from another forum, whoever guesses the correct location gets to post their own picture - only condition is that it is a well-known section of cave not some obscure dig. Looks like the old forty. Charterhouse, just after all the tight entrance stuff? Definitely the forty foot pot bypass climb. The final climb of Dreanen entrance series? Rope out of shot. Elaine, Seddon, Gerbill007 & Mrodoc. Elaine got the first correct answer, so gets to post the next pic. Here you are. The only picture I could find that was not Templeton! 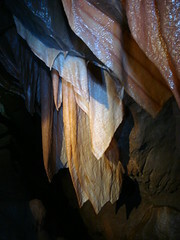 I need to do more caving with my camera!! That didn't take long - yes Andy it is Fernhill. Your turn. Yes, I know too, but don't like to get them all right!! I'm going to guess at Ubley Farm Swallet, Ubley something anyway, the one that connects to Nettle Pot. I cannot see any picture!